I’m ashamed to admit that this summer’s heat has kept me away from Austin’s ever-burgeoning food trailer scene. Except for a couple of strategically planned car-to-trailer incursions for ice cream sandwiches at Coolhaus, I’ve avoided eating outside for what seems like forever (but was realistically just 4 months). Last week I decided I was simply unwilling to let the scorching menace that has been our summer keep me from trying new tasty treats and old favorite dishes from outdoor eateries. Weather be damned, I was going to enjoy some trailer grub. I’d heard rumblings in the online world about a new ravioli trailer with a locally-sourced bent and, because I agree that it’s never to hot for pasta, I went trailer hunting. 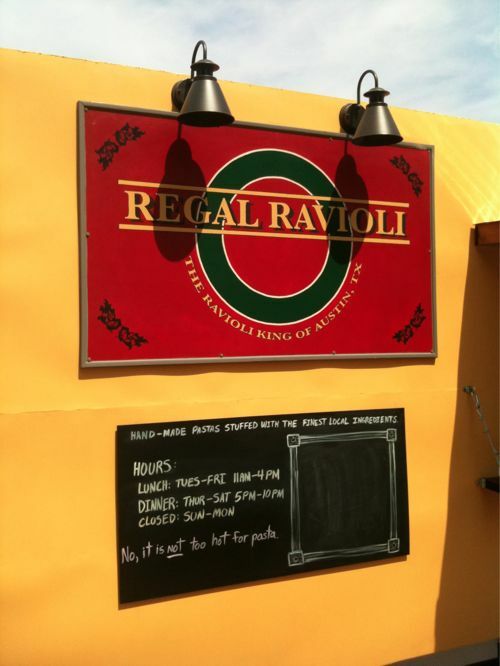 After only a couple of wrong turns on 6th street because I can’t read maps, I found Regal Ravioli situated next to the well-established Trailer Perk at E. 6th and Comal St. 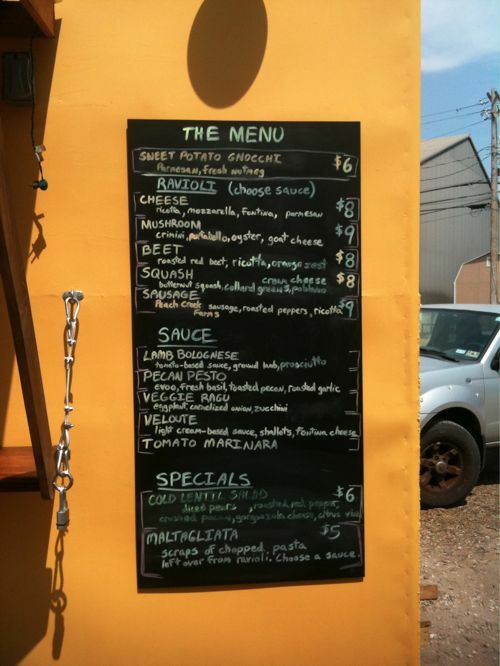 The bright yellow trailer is hard to miss, but what really stands out is the menu. Their premise is simple: pick a ravioli and pick a sauce. Enjoy your custom concoction. Each and every ravioli is hand-made and they have flavor combinations for everyone. Not content with offering the standard cast of ravioli characters – cheese and sausage ravioli, bolognese and marinara sauce — this trailer offers some creative interpretations on stuffed pasta that feature beets, collard greens, poblanos, and more. They sure are thinking out of the ravioli box. I can’t tell you how tempted I was to go with traditional cheese ravioli and lamb bolognese, because I’m a sucker for a good bolognese and an even bigger sucker for lamb. But, because I wanted to think outside of my own box and I’m in a squash sort of mood, I went with the butternut squash, collard green, cream cheese and poblano ravioli. After consultation at the window I was advised to try the pecan pesto and took their word for it. I wasn’t disappointed. The collard greens helped balance out the sweet squash while the poblano added a low burn at the back of the throat. The pesto was light, just a little crunchy, and full of flavor. While I was a little concerned about the serving size for the price, I was completely satisfied when I was done with my lunch and think a little extra cost for hand-made ravioli featuring local ingredients in interesting ways is worth it. So is supporting local chef entrepreneurs. Paying that little bit extra for good food made by good people is one of the reasons I love eating in Austin. Besides ravioli this trailer also serves up gnocchi which is a personal favorite of mine, so I’ll be back to give that dish a try. If their pasta craftsmanship is any indication, I’m expecting a light and fluffy dumpling just perfect for carrying that lamb bolognese. Regal Ravioli is relatively new to the scene so not much has been written about them. If they keep up the good work though I expect that to change soon. 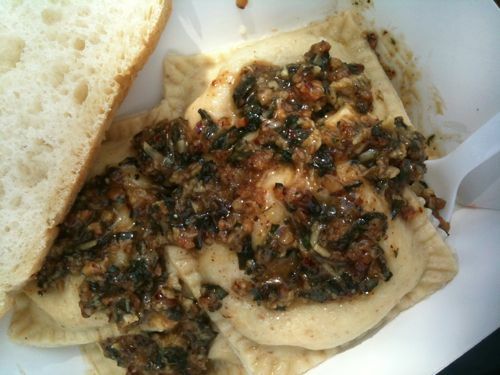 The Yelpers who have tried Regal Ravioli are very happy with their experiences. The folks over at Mercury Hall loved their meal so much they wrote a blog post about it. As the weather gets cooler I’d like to suggest that you give Regal Ravioli a try and share your favorite combination in the comments. If we all work together we can try every sauce and pasta combo they offer!